There is no denying that make-up is every bit as important as the clothes during Fashion Week and it most certainly completes the final look – where would we be without it girls?! Fashion Week Feb/March 2011 has confirmed that for Autumn/Winter 2011, its all about having a bold lip and keeping the rest of your make-up to a bare minimum. 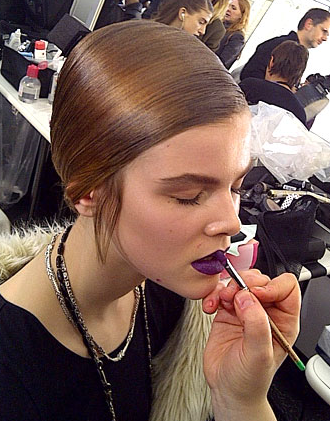 My favourite lip colour from fashion week has been the striking purple we (almost) saw at the YSL show in Paris. Slightly gutted they pulled it last minute, but TellusFashion still reckon its a ‘dead cert’ for next seasons palette! What were your favourite Beauty looks from Fashion Week? This entry was posted on March 8, 2011 by Heather Mhari. It was filed under Fashion and was tagged with AW11, Bold Lips, Fashion Week, Hermes, Paris, TellusFashion, YSL.